Only three today; I did very little reading over the holiday break aside from working through some Fables trades, and I’m woefully behind on all the new stuff that’s come out in recent weeks. Bear with me as I try to fill some holes in my collection and get somewhat up-to-date. I hope everyone had a safe, warm, and lovely holiday. Birds of Prey #7 – Aww, this issue broke my heart a little. This title has been consistently excellent (I usually avoid reviewing it because I would just be going “YAY THIS IS AMAZING I LOVE BIRDS OF PREY HOORAY GAIL SIMONE” every month), and #7 is no kink in the chain. 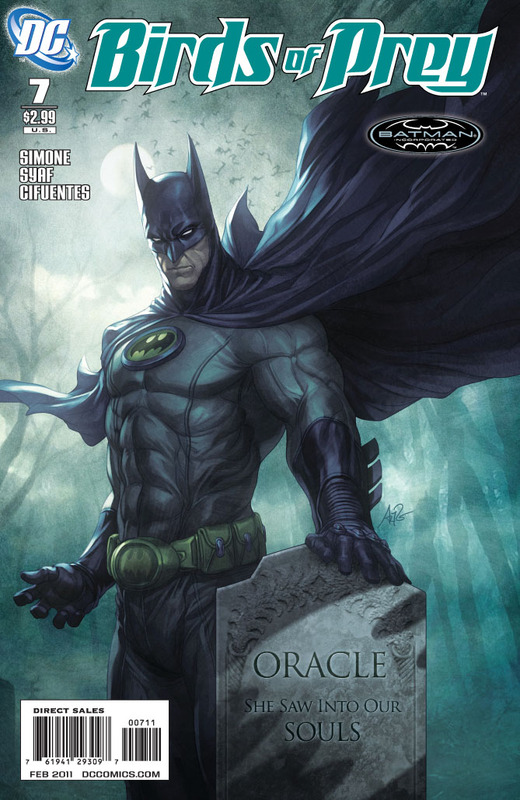 The usual mix of action, humor, drama, and intrigue, this issue finds Bruce Wayne Batman (so funny that we have to distinguish which Batman we’re talking about these days) checking in on Oracle, who proceeds to take him on a tour of her new headquarters. There’s also some fuel to the “DC is killing off Oracle” rumors, but it’s not exactly what you think, and I’m interested to see if it goes where I predicted it would in Barbara simply taking on a different mantle. Best scene in the issue involves the Birds on a night out—any time Zinda’s got a beer in her hands, you can guarantee hilarity. My only peeve with this book right now is the fact that every single issue has to introduce all the characters over and over and over again: “Black Canary. Dinah Lance. Devastating sonic scream. Blah blah blah.” All right, editorial, we get it. Can we leave the new-reader-friendly intros to just the first issue of each new arc and leave them there? Thanks. Birds of Prey #8 is due out this Wednesday; I’ll be doing my happy dance. 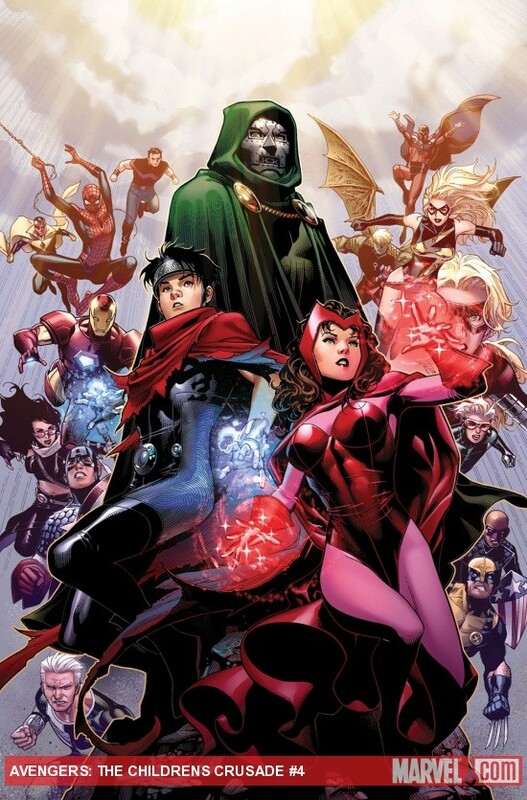 Young Avengers Children’s Crusade #4 (of 9) – I really, really, really want to hate this book. I want to hate it because it’s absurdly late, and I feel neglected as a consumer. I feel like Heinberg and Marvel are going to take their sweet time, regardless of promises. I want to hate them for that, and I want to not buy this book. But … oh, it’s just so good. I just love it. Issue four finds Wiccan up against Doctor Doom; an amnesiac Scarlet Witch without her powers and about to be wed; a ticked-off Wolverine seconds away from killing her once and for all, and the surprise re-emergence of a character I did not see coming at all. This mini is apparently worth the agonizing amount of time it’s taking to publish, because it’s clever and FUN and entertaining and … it’s FUN! It’s a lot of what most comics are missing these days. There’s a real PLOT that is actually FOLLOWED. There’s exposition and dialogue that come together to–*gasp*–give CHARACTER. And have I mentioned that it’s fun? Quite frankly, I need more Young Avengers in my life. This book is awesome. Go buy it right now. – Consistently encourages violence and revenge. Whhaaaa? Why, I ask, are the words “Wonder Woman” still being displayed across the title page of this book? I understand she’s basically a “different character” with a different back story and continuity here (thanks again, JMS), but … whhaaaa? Why, in her CORE AND ONLY BOOK, are we delving even further and further away from what makes Diana different from other superheroes, as opposed to a carbon copy of every other angsty teenager DC already has in their arsenal? Why are we delving further away from who she is? Couldn’t DC have done an “Ultimate” version of Wonder Woman—call it “All-Star” or whatever other line you want to give it, and leave the Wonder Woman we all know and love alone in her main title for those of us who appreciate her? I might have been able to tolerate this version if I knew she wasn’t the only version currently available to me. I feel like I keep asking the same questions over and over. Why is Diana still the only one of the Big Three who doesn’t have more than one title? Wasn’t this the perfect chance for that? How do DC expect to encourage love for a character by completely changing every aspect of her personality? Have we learned nothing from the disaster that was mod squad Wonder Woman? I’m not even going to touch on my myriad other complaints. My only shred of hope here is the fact that the plot alluded to a very slight possibility of things eventually returning to normal, and I am beside myself with the desire for that to happen. I just don’t think I can hold my breath long enough. 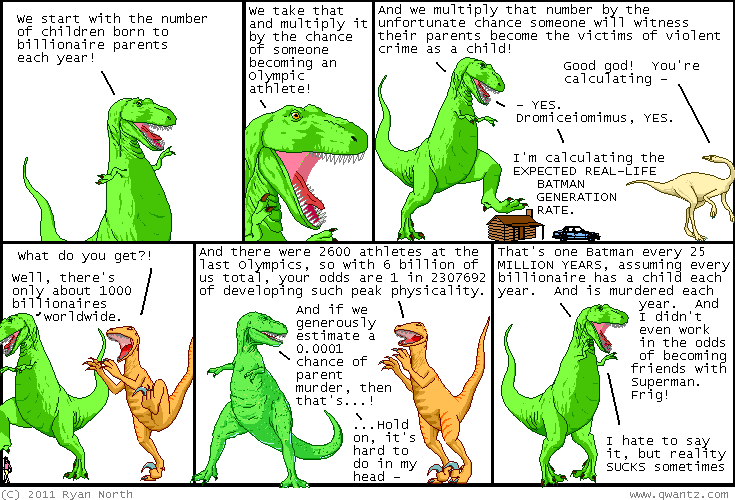 From Dinosaur Comics, with thanks to my friend Jon for pointing it out. This entry was posted on 01/11/2011 by ravenhaired. It was filed under Awesomeness, Comic books, Female Characters / Creators, Reviews, Things that Kill my Soul, What I'm Reading / Wednesday New Comics and was tagged with Allan Heinberg, Birds of Prey, DC, Gail Simone, Marvel, Oracle, Phil Hester, Wonder Woman, Young Avengers. It is time you voted with your pocketbook and stopped buying wonder woman. If more of us do that, then they will understand. That’s what I did with Green Lantern 10 years ago. I just stopped buying it. Yes, they are the writers and they don’t have to listen to me, but I don’t have to read them betraying all of GL history with making Hal Jordan a crazed villain. I didn’t return to GL (or Justice League) until they “fixed it” (such as it is). That’s what we have to do now with WW. I hear you and I totally agree; but I assure you that just because I’ve been reading these issues of Wonder Woman doesn’t mean I’ve been supporting them with my wallet. One of the perks of working at a comic shop is the accessibility of being able to read almost anything I want. Typically my moral standard is not to take advantage of that privilege, so I will in fact buy whatever’s on my pull list (such as Birds of Prey or Avengers), and there would have been a time where I’d have bought Wonder Woman–sadly, that time is no longer. Now if only I could learn to stop reading it at all and save myself the mental anguish. ;-) But you know what they say, it’s like a car wreck…. A little off track, but since you are such a big Birds of Prey (and “good Wonder Woman”)fan did you read Brave and the Bold #33? Such a great story around Barbara Gordon in a flash back to when she was still Batgirl. I DID read that story! It was a great issue. 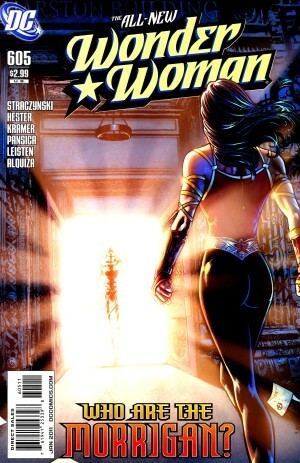 Shockingly enough, Straczynski wrote that issue, which at the time, filled me with hope that his run on Wonder Woman would be great. Little did I know.